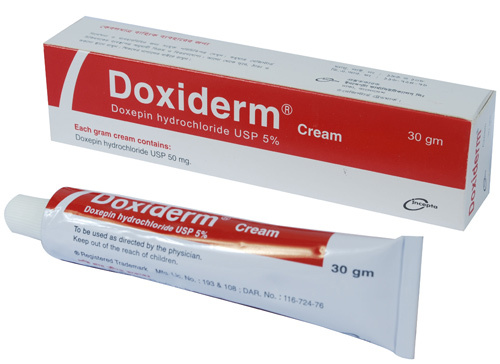 Doxiderm Cream: Each gram cream contains Doxepin hydrochloride USP 50 mg.
Doxepin hydrochloride is one of a class of agents known as dibenzoxepin tricyclic antidepressant compounds. Although doxepin HCl does have H1 and H2 histamine receptor blocking actions, the exact mechanism by which doxepin exerts its antipruritic effect is unknown. It can produce drowsiness in significant numbers of patients, and this sedation may reduce awareness, including awareness of pruritic symptoms. Doxiderm cream is indicated for the short-term (upto 8 days) management of moderate pruritus in adult patients with atopic dermatitis or lichen simplex chronicus. Adult and child over 12 years: apply thinly 3–4 times daily; usual max. 3 g per application; usual total max. 12 g daily; coverage should be less than 10% of body surface area. The use of Doxiderm cream in pediatric patients is not recommended. Safe conditions for use of cream in children have not been established. Dose selection for an elderly patient should be cautious, usually starting at the low end of the dosing range, reflecting the greater frequency of decreased hepatic, renal or cardiac function, and of concomitant disease or other drug therapy. Drowsiness, local burning, stinging, irritation, tingling, rash; systemic side-effects such as antimuscarinic effects, headache, fever, dizziness, gastro-intestinal disturbances has been reported. Cautions should be exercised if there is susceptibility to angle-closure glaucoma, urinary retention, severe liver impairment, mania and also in pregnancy and breast-feeding. Drowsiness may affect performance of skilled tasks (e.g. driving) so patient should be careful. Pregnancy: Category B-There are no adequate and well-controlled studies in pregnant women. This drug should be used during pregnancy only if clearly needed. Nursing Mothers: Doxepin is excreted in human milk after oral administration. It is possible that doxepin may also be excreted in human milk following topical application of Doxiderm cream.